Telling the Bees is the closing track on the album and is therefore the final episode in our series of blogs. I wrote the music first which was inspired by the title. I find having a title helps to set the mood and instrumentation of the piece within my imagination. It's like having a final destination in mind. 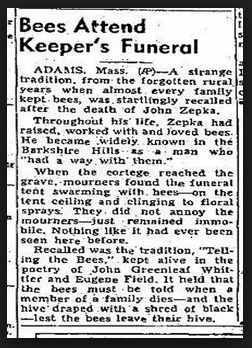 Telling the bees is a traditional bit of folklore surrounding bee keeping. There is also a notable poem with the same title written by John Greenleaf Whittier. My version is inspired by the folkloric tradition rather than Whittier's poem. I wrote Telling the Bees on a 12 string acoustic guitar, tuned to DADGAD with a capo on the 6th fret - which makes the tuning G#D#G#C#D#G#. The reason I used the capo was to make sure that my voice had a yearning quality to it. (Budding songwriters please take note - always make sure that the key of the song you're writing, shows off the singers voice to their best advantage!) Although be warned that guitarists may curse your name forever for doing so! I had also updated my DAW during the summer of 2014 and this was the first piece of music that I'd written with it. I had the melody, the chords and the arrangement down quickly. The chorus words are simply the title of the song repeated over and over. I then lived with it for a few weeks and let the story of the song settle in my mind. Songs have a habit of being ready when they're ready to reveal themselves. Some songs happen quickly while others take their time to fully emerge. You can rush these things but in my experience, if you can, let them unfold as they will. It's good to have the external stimuli of a production deadline but make sure that you give yourself the time to think about the words thoroughly, or you may regret it later. When I began to write the lyrics for this song, I imagined the first verse being set towards the end of the First World War. Many events happened in the UK to commemorate WWI during 2014. We are all creatures of our time and so these life events either consciously or subconsciously impact upon the subject matter of the songs that Greg and I would write to make up Folklore. 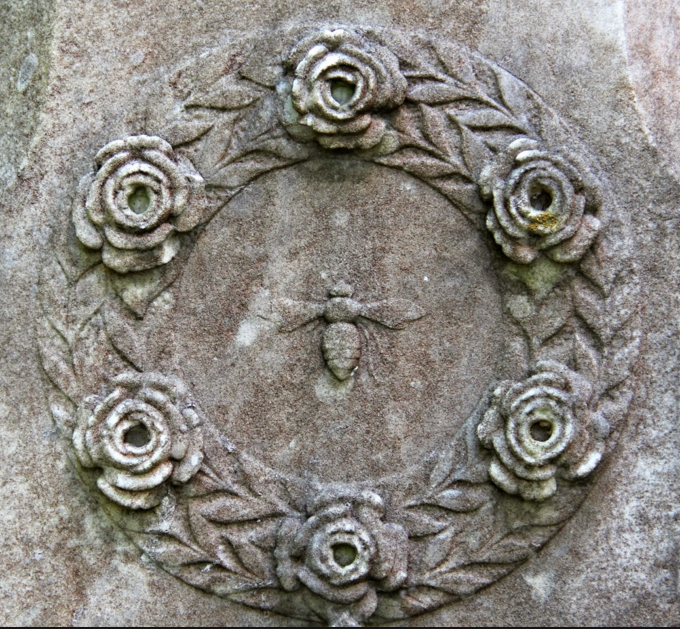 In the song narrative, a grieving war widow tells her son that he now must 'tell the bees' of his fathers death and also that he must pick up the mantle and become the next beekeeper. I like the idea that these traditions would keep on being passed down the generations. This of course is a very strong theme of the Folklore album and it also links back to themes of the English Electric recordings. This song has a sense of the passing of time and of course, significant life events come and go throughout the years. Now the father is gone, the boy has had to become the man who carries it on. Years later he meets a girl, they marry, they have a son and so once the child has grown up - he too may choose to carry it on. 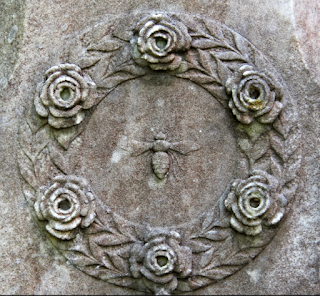 It is a simple lyric about the human cycle of life, death and rebirth. The "1,2,3,4..." count in is my voice being picked up by my 12 string guitar mic. We liked it and so it stayed in the final mix. Oddly enough this count in would have been the very first part that I recorded at the demo stage of the recording process. The initial moment captured and preserved. When Greg and I were going through what we had and what we needed in terms of songs for Folklore, I played him my demo of Telling the Bees. He liked it and he instantly said that his initial thought was that it would make a strong final track for the album. As the music is written and recorded the final pieces start to be drawn together as a cohesive body of work, jostling for their final positions in the album running order. 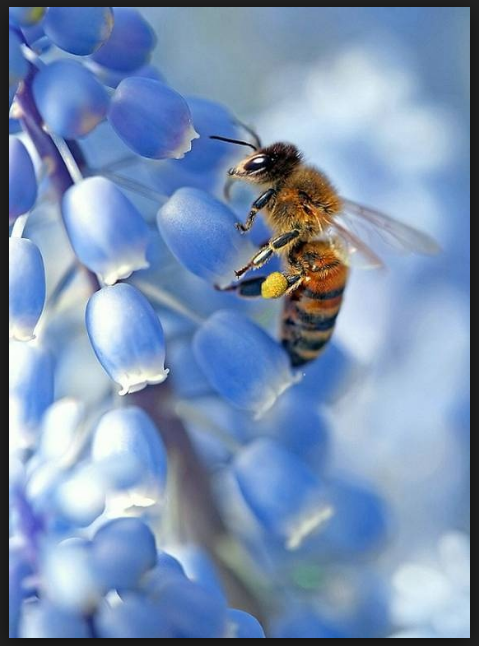 Telling the Bees has remained the final track. Danny Manners brought the Prog to this song with his gorgeous Mellotron choir part at the end which makes the track lift as though being somehow exalted at the final chorus. He also slips in a cheeky little piece of Rimsky Korsakov's Flight of the Bubble Bee in the organ embellishments just before the end of the piece. Nick D'Virgilio plays the most audacious drum fill in the history of of audacious drum fills shortly before we enter into the middle section where Dave Gregory brings the beautiful slide guitar solo into soaring technicolour. 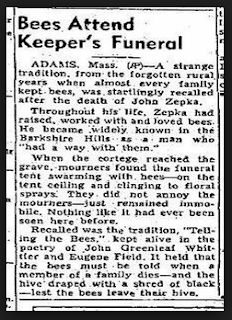 To conclude my post, I have included an old clipping [below] from a local paper which perhaps may go towards showing that there is more truth in the folklore of Telling the Bees than at first meets the eye. We (Greg and I) hope that our 'Folklore' blogs have been a useful source of information in the build up to the release of Folklore. As always, there are more stories to tell and sure enough, we are currently working on a follow e.p which will be called Skylon, which is due for release in April 2017. Winkie is the true story of a war hero. To me Winkie most certainly has a 'from the makers of Judas Unrepentant' vibe about it. I think it takes some of the ideas present in Judas and extends them. 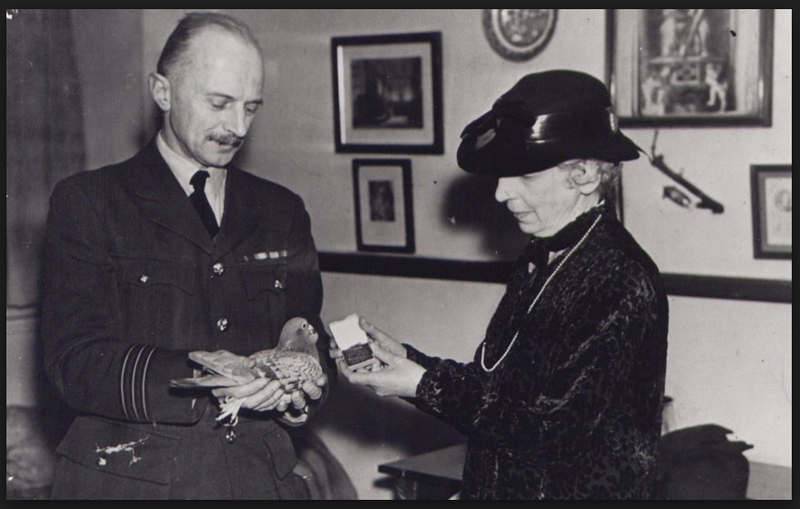 Just as Judas tells the story of infamous art forger Tom Keating, Winkie tells the story of how a blue chequered hen saved the lives of her aircrew and would become the inaugural recipient of a PDSA Dickin Medal (the animal equivalent of the Victoria Cross.) It is a fantastic story that I wanted to set to music and when Greg and I were discussing ideas for the album, Winkie was a no brainer. It had BBT written all over it and we had to do it. When researching the background to the story, I have read and seen various accounts of what happened and there are some significant variations in the finer details. For instance, I saw Winkie's number being listed as NEU40 NSL but I have also recently seen it listed as NEUH40 NSL and there are other variations too. I went with the former. Another example is when an exhausted Winkie made it back home to her loft in Broughty Ferry. Although it says that she was discovered by her owner George Ross, I went with her being discovered by Sgt Davidson (the loft manager) because I liked the storytelling of it. The source of this information was a highly informative documentary called War of The Birds. I felt that this way was the right way to gave the lyric a solid, personal and realistic element. Although it states that George Ross was Winkie's owner, there are conflicting reports of who discovered her and who made the life saving call. As expected, with the advent of easily accessible social media, Winkie's tale has inevitably entered into the realm of folklore. Albeit with specific details being slightly altered and retold and reinterpreted as her story is recounted (and I am no exception.) It is what we humans do when we pass our stories on and hand them down. Yes, I have taken poetic licence to make it work as a piece of music (as I usually do.) but I went with what I felt would make an interesting story become an engaging piece of music. When writing and arranging Winkie, I wanted the size and scale of the music to be in proportion to the heroism of Winkie's act and in complete contrast to her physical size. I also wanted it to sound like the soundtrack to an adventure movie. The music follows and responds to what is happening in the story line. At times it is bombastic and at then at other moments it is fragile. In comparison to beady eyed Grimspound (the crow) who fixes us all with his piercing gaze from the cover of Folklore, Winkie is a pigeon who is in no way any less determined. The gargantuan effort of her flying free from the wreckage of the downed aircraft and flying 120 miles back to her loft, heavy with salt water, covered in fuel and oil. Flying in awful weather conditions she arrived back at her loft in a bedraggled and exhausted state. Flying at night in harsh conditions. She was the only hope of survival for the four airmen. Their lives rested solely on her making it home. A photograph of Winkie with her grateful crew. Major W.H. 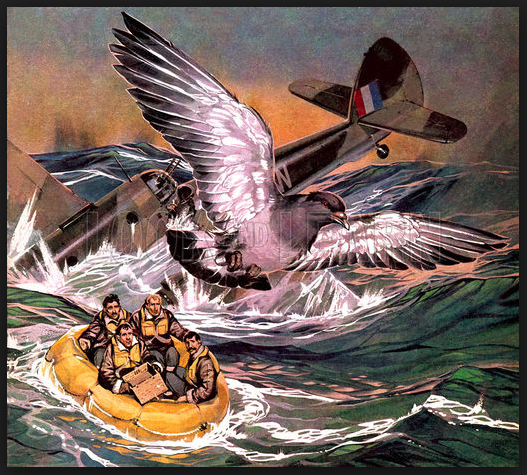 Osman campaigned for the continued funding of the National Pigeon Service which had served the war effort well in WWI. Once the war was over, the funding was cut because the War Office believed that newly introduced radio communication technology was the way forward and pigeons were old hat. Major Osman was not convinced and he fought hard to keep the National Pigeon Service funded and active incase of breakdowns in radio communication. 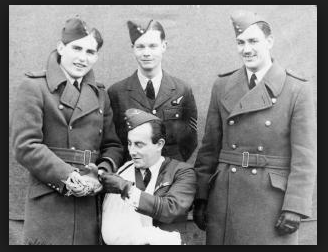 Major Osman also insisted that two pigeons would accompany each bomber crew incase radio communications broke down whilst on mission. 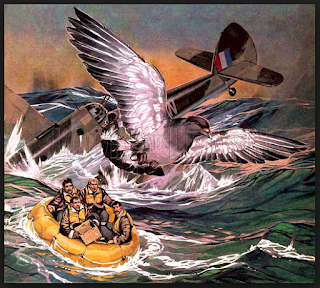 All very fine in theory but the NPS (National Pigeon Service) cost money to the War Office and the one thing that they needed to justify their expenditure was exactly the thing that the NPS was trying to avoid happening. In order for the NPS to get funding, conclusive proof was needed. On February 23rd 1942, thanks to Winkie, the NPS would earn their justification and that is what this song is about. Safely back at RAF Leuchars the grateful aircrew held a dinner in honour of Winkie in their mess. She was in her cage at the head of the table. 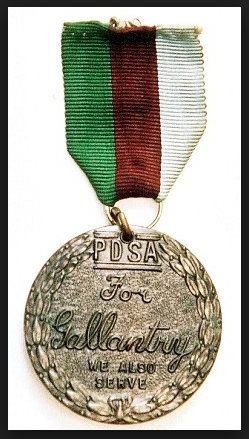 In 1943 Winkie was the first to be awarded a PDSA Dickin Medal for saving the lives of her crew. By writing a piece of music about Winkie, she becomes a folk heroine and she is a very deserving one at that. I liked this subject matter because I thought that it was an extraordinary story and it cried out to have a song written about it. Winkie is without doubt a true heroine. And it only goes to show that heroes can be any size. Bountiful we raise a glass to thee"
This track was first heard last summer as the title track of BBT's Wassail e.p, which was released to herald the return of Big Big Train to the live stage. 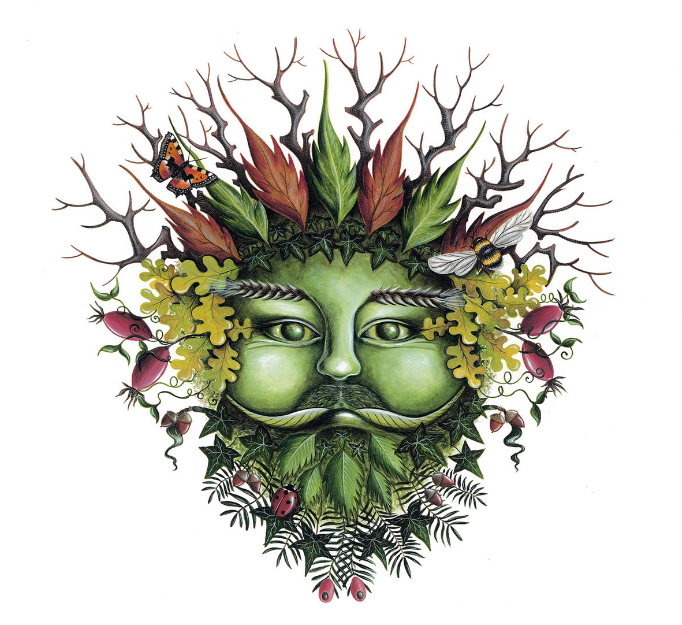 The e.p featured a beautiful cover (above) painted by Folklore artist Sarah Louise Ewing. "It looks like a Christmas card!" remarked Team Rock Radio's cheeky Phil Wilding when he interviewed Greg and Danny live on his radio show during the height of summer! He did have a point. Ideally it would have made a good Yuletide release but because it had been a while since the English Electric albums, we thought that the fans would enjoy having some new music from the band to whet their appetites in advance of our live shows. 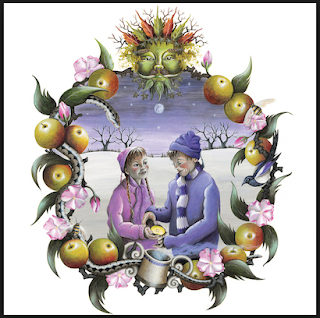 An explanation of what Wassail means was given in the sleeve notes of the e.p and it has been mentioned in various interviews that Greg and I have done over the last year. 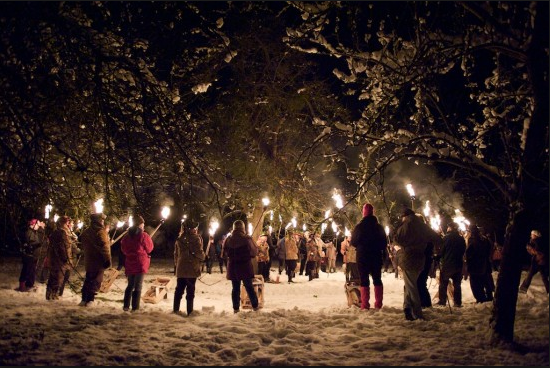 If by chance you have not seen or heard them, I've included a couple of links within this paragraph - Wassail is an English pagan ritual that was performed in apple orchards in England in order to ward off evil spirits and bless the trees so that they would yield a bountiful crop. I understand that it is making a bit of a come back. I wanted to musically pay homage to some of the great music that has come out of Real World, especially the Peter Gabriel tracks 'Sledgehammer' and 'Steam.' 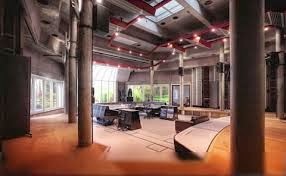 I wanted Wassail to have the huge and present drum sounds that those tracks possess and recording our drums in those studios would give us access to the same acoustic environments. Stone and Steel features the 'Wassail Drum Session' as an extra on the Blu-Ray and it shows Nick performing, Rob and Ollie engineering and me producing the session. Wassail was written with the idea of it being a 'single.' It is a pagan chant that grooves along and its subject matter is powerful. 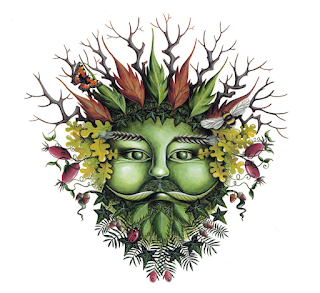 We loved the image of the green man that Sarah had painted at the top of the frame for the e.p cover, so we asked her to paint another picture, solely of the green man because we thought it would make a strong image for BBT marketing. During yet another epic phone call with Greg, we spoke about visuals for the forthcoming live shows. We had chosen Wassail as one of the pieces in the set and we spoke about having a mask made, based on Sarah's picture. 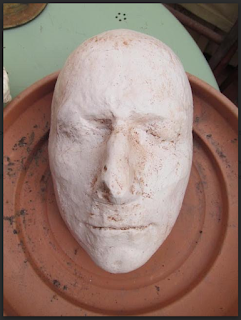 A week later I was having a conversation with Simon Withers and I mentioned the idea of the mask. Simon has been involved with the Nottingham art scene for years and he instantly recommended Stephen Jon - mask maker extraordinaire. 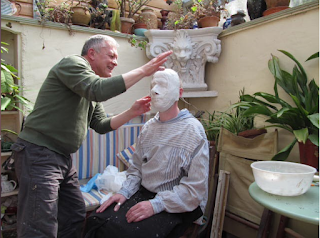 The following Thursday I was at Stephen's house having a plaster cast made of my face. 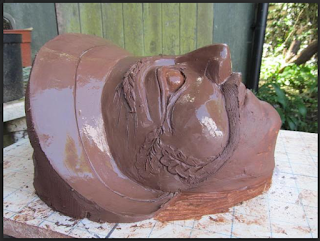 Working in clay, Stephen is then able to build up the features of the mask. Hours of skillful sculpting, with intricate detailed items placed over paper mache and then painted. A few weeks later I return to meet 'Greenie' for the first time. 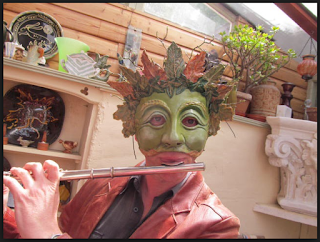 The first fitting is to make sure that I can wear the mask comfortably and also play the flute while wearing it too. 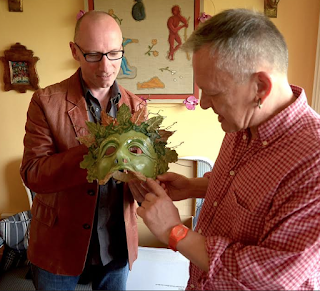 Stephen's masks are featured and worn not only by Stephen and myself but also by some of the passengers who attended the 'Folklore' music video shoot on St. Catherine's Hill near Winchester a few weeks ago. The whole of BBT wore Stephen's masks for a Prog Magazine photo shoot and as soon as the masks were on, the capering begins. Masks are very interesting things when introduced into an environment. When Wassail was performed live during our Kings Place shows, it came of age. It was written to be performed as a piece of live entertainment. When I wear the mask live, I become the character - he makes his entrance midway through the song and he takes his bows before leaving the stage. (See Stone and Steel) I am very interested in the folklore element of masks. They tap right into the spirit of our ancestors wearing them to become something other than they were. Wassail was nominated in the Progressive Rock Awards 'Anthem" category and also in the Classic Rock Society's 'Song of the Year' category. 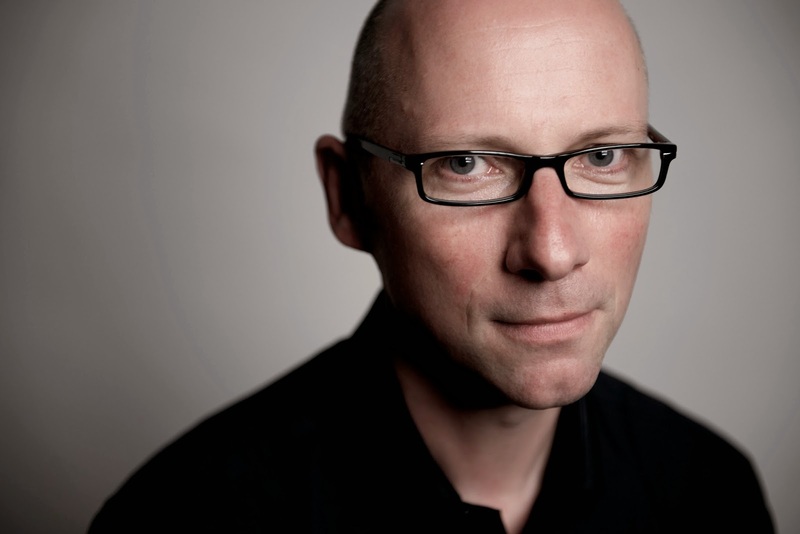 It has been played several times on BBC Radio 2 by legendary broadcaster Bob Harris who is a supporter of Big Big Train music. Hearing Bob's iconic voice reading out the opening lyrics to Wassail will remain with me until the end of time. "Let us begin where it all began..."
This is the first of eight blogs that will give background information about the songs on our new album. 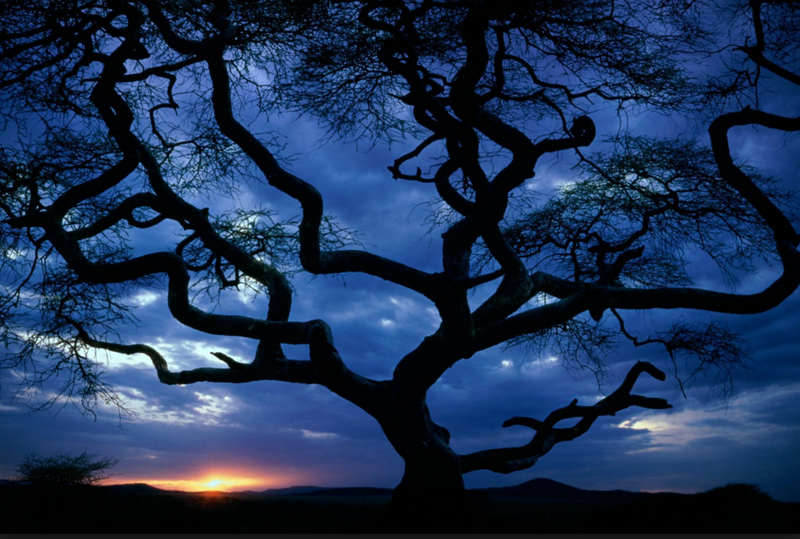 Folkore [the album and the track] starts off where most of our ancestral stories most likely began. 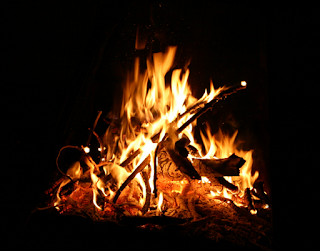 Around the cracking flames of the campfire. Stories told after sunset, with no daylight reassurances or distractions. The cold dark night forcing us to huddle closer together, among the security of the 'pack', beside the warm glow of the flames. The night focusses us in. 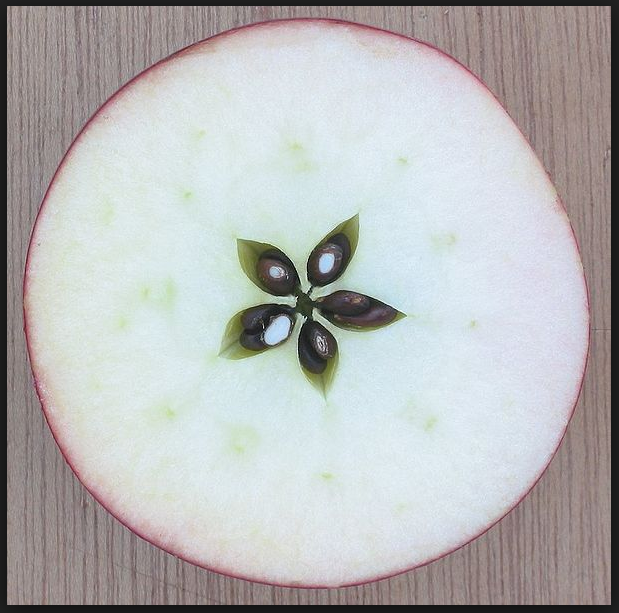 Our minds become much more open to suggestion. Our imaginations are susceptible, impressionable and pliant. It is at these very moments, when the unbelievable can all too easily be believed. The moment is right and the stage is set. Firelight makes the shadows dance. Flickering light contorts the animated features of the storyteller - transforming them into something other than they are. Women and men, young and old - rapt listeners all. Although the older listeners have heard these stories many times before and they know what is to unfold. They too delight in the engrossed faces of the youngsters. Open mouthed and spellbound as they listen to wondrous tales. Or recoiling in fright to the comforting arms of their mothers. Caught up in the drama of the moment. Hanging on each word and every plot twist. These tales Ignite and fan the flames of our fertile imaginations. These are our stories of love, words of wisdom, cautionary tales. Heroic adventurers featuring fantastical creatures and conniving villains. Supernatural tales, stories involving the incredible luck of particular individuals. Stories that reveal the fate of their many characters and the consequences of their actions. It is an integral part of who we are and who we think we are. Forming the bedrock of our cultures. Passed down by word of mouth from generation to generation - the fine details and factual information sometimes abandoned and exaggerated in favour of the drama within the story as these tales are reinterpreted from storyteller to storyteller. Country to country, each adding something of themselves to embellish the tale. "The pen is mightier than the sword, the music of the word is scored"
Each development further enhancing the power of the word. The emergence of the written word, the development of the ink press, the incredible technological advancements of the 21st century - all fuel to our fire and grist to the mill. We are still making out own cultural folklore to this day - the addition of the press and social media allows our stories to be told at a terrific rate. Folklore is a deliberate companion/bookend piece to Wassail. It shares the same chord sequence and it uses the same mandolin/violin/flute riff. The instrumental play out at the end of the piece features members of the band taking a short solo section then passing it on to the next player and so on until the piece concludes. In addition to Folklore being the first track on the album and the title track of the album, it will also be the first 'single' taken from the album. A short film (music video ) has been shot to accompany it, featuring a cast of extras drawn from our fantastic 'passengers' on the BBT Facebook forum. My friend and fellow band mate Greg Spawton will post a blog next week in which he writes about the next track on Folklore. This is just a quick post to say that with the arrival of our new studio album FOLKLORE, Greg and I will be posting a series of blogs in which we write about the stories behind each of the songs on the album. The first blog will be posted at the beginning of April 2016. We did this with our English Electric releases and many of you commented that you enjoyed reading them, so we are doing it again! As you may know, we are in the final stages of completing not only FOLKLORE but also our Blu-Ray release of Stone & Steel which I must say is both looking and sounding amazing. Exciting times ahead aboard the Big Big Train. This post is just to say a big big thank you to all those who voted for me in the male progressive rock vocalist category in PROG magazine. I am very honoured and deeply flattered to have been voted number one. I would like to thank Greg and Andy for giving me the opportunity to contribute to the music of Big Big Train back in 2009. I also doff my cap to my talented band mates aboard the Big Big Train for their musicality and arrangement skills. Big Big Train is a fantastic canvas to work with because it affords us the flexibility to bring the storytelling within the material to life. Congratulations also to Nick D'Virgilio for being voted in sixth place in the drummers category, BBT for being voted second best band and Full Power being voted fifth place in album of the year. The Underfall Yard, Far Skies Deep Time & English Electric - what a fantastic ride it has been! Here's to what comes next. It looks like 2014 has already got off to a great start. Thank you very much. Here we are at the end of another year and what a fantastic year it has been, not only for Big Big Train but also for Progressive Rock Music in general. There have been some tremendous releases in our genre this year. This post is intended to be a brief overview of our year, from my 'behind the mic' viewpoint. On the 2nd of January 2 2013, we found ourselves on location at the Eastleigh Railway Works in Southampton. As you would expect, it was cold despite the addition of an industrial heater. The works were in use by the railway carriage engineers and we were in awe of the sheer scale of the work that these men carry out, as if it was nothing. It felt most strange performing along to our track in the midst of all this dramatic industrial scenery. Eventually though, after a few runs through, we began to get used to the absurdity of it and we adjusted to the weirdness of it. The video was made to give those who are interested in us, a glimpse of what it might be like, when we perform live. The video was directed by Peter Callow and upon it's release in September this year, it has helped to opened up new possibilities for us. January 2013 also found me working on material for Andy Tillison. I'd been invited to contribute vocals and had received audio stems. I started working on vocal arrangements for what would become Le Sacre Du Travail the seventh studio album by The Tangent. 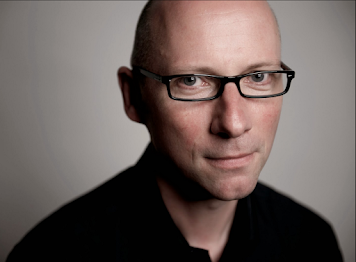 Andy is 'the voice' of The Tangent and it is his idiosyncratic narrative that is identifiable as the vocal sound of the band. So I concentrated on building my vocals around his top lines. I enjoy The Tangent and working on the material was thrilling. Chris Topham of Plane Groovy approached BBT in 2012 with the proposal of releasing EEpt 1 on vinyl. Initially we thought that having it available on vinyl would only appeal to a small and selective niche market of vinyl junkies but we were wrong. Releasing it on vinyl had a much bigger impact for us than that. The resourceful Marc Catchpole managed to place a vinyl copy of EE pt 1 into the hands of legendary broadcaster Bob Harris, when Bob was hosting the Classic Rock Society awards. We have been labelled as being a 'crossover progressive rock band' by some and this came to be justified when 'Uncle Jack' was played on Bob's show. This opened the door and subsequently other BBT material was broadcast, which has helped to bring our music to a wider audience. English Electric Part 2 came out in March 2013, continuing seamlessly on from where Part 1 left off. Like it's sibling, it too is available on vinyl. It was a tricky process getting the balance right over the two English Electric releases. Although they would eventually be merged into one, both releases had to have their own zen about them - and work together as a whole. Full Power finally emerged in September 2013. It is a colossal, sprawling- widescreen-Technicolor-epic thing to behold when presented like this. The 'directors cut' of English Electric parts 1 and 2 along with four additional new pieces, collated in a new definitive running order and lavishly packaged. Make Some Noise was also released at the same time along with its accompanying video and in an e.p format. Reaction was positive but for a few, the song caused a few raised eyebrows. It's a straight forward catchy rock song with fewer progressive elements than usual. It also kicks off Full Power. Q1: Is it a new direction for BBT? Q2: Why is it not as typically BBT as the material on EE pt1 and pt 2? A: The music reflects the subject matter of the lyric. It is a suitable soundtrack to the concept of the song which is about young people forming rock bands. The song features some musical nods to the signature sounds of some of those classic artist who inspired us to start playing in bands. Even the lyric is deliberately untypical of BBT. When we write songs for BBT albums, Greg Spawton has a particular style to his writing which has been the bedrock of BBT dating back to The Infant Hercules. So when I began co-writing and then submitting material for the band, I did not want it to sound like Greg's writing and I did not always want it to necessarily fit in with what BBT would usually do. I wanted to offer an alternative and show the breadth of what we're capable of. I'm not interested in writing to formula and so I only write what interests me. Judas Unrepentant and A Boy in Darkness are most certainly progressive rock pieces, while Uncle Jack and particularly Leopards are deliberately less so. However, Uncle Jack and Leopards have both been lucky for BBT by being played on Radio 2. In early September we were invited to attend The Prog Awards 2013. So Greg, Andy and I went off to Kew Gardens. We were nominated in two categories:- Best album and breakthrough act. We won the latter and were absolutely delighted. It was an honour for us to receive the award because it was the readers who had cast their votes. Highlights included meeting Andy Tillison [actually - it was the very first time I met him which is odd considering we'd worked together on Le Sacre Du Travail earlier on in the year], Steve Hillage, Steven Wilson, Roine Stolt, Pete Trewavas and Matt Stevens. BBT were also name checked by the jovial Mike Portnoy during his acceptance speech for his virtuoso award - thanks Mike! A big big thank you to Alison Henderson who organised The Big Big Weekend in Winchester, along with visits to notable sites that feature in BBT material alongside cultural presentations by Greg and Alison. A curry was eaten (because that's how this train rolls] and a visit to Aubitt Studio where Andy Poole and Rob Aubrey had Judas on the slab ready for dissection! I'm thrilled that my fellow Tangenteer Jakko Jakszyk finally landed THE CRIM gig. Much as I've enjoyed the work that Adrian Belew did with the band, I can't wait to hear what they come up with in their newly resurrected current line-up. The final two months of 2013 we have been busy getting ready to go into Realworld during August 2014. We have chosen the material that we will perform and shortlisted five tracks to get into shape by the end of January. I have been busy arranging the various layers of vocals in a way that they can be performed by the band. It's sounding good so far! Thank you to all of you who are on the BBT Facebook group page, who make it such a great place to visit. Thank you to all who voted for us in the various Progressive Rock Polls this year. Thank you to all who support us and spur us on.